Twitter has a rich tradition of spoof accounts that are used to parody public figures, organizations, and fictional characters. And Yukon is no stranger to the trend, naturally boasting a colourful collection of online lampooners. Before I get to that, though – just in case you’ve been living in a cave for the last seven years – here’s a brief introduction to Twitter. Simply put, Twitter is one of the internet’s most popular social media platforms, currently boasting about a half-billion accounts. Average folk like you and I (@robulack), alongside luminaries the likes of US President Obama (@BarackObama) and Yukon Premier Pasloski (@YukonPremier), regularly leverage its 140-character limit to publicly crack wise and inform alike. Justin Bieber (@justinbieber) is currently Twitter’s most popular resource with over 42 million followers – more people than live in Canada. But that makes you wonder: how do we know it’s really Justin Bieber on Twitter? Well, it just so happens that Twitter verifies the accounts of its most famous users. You can tell that Bieber’s really Bieber by the blue checkmark badge on his profile page. Ironically, it’s the platform’s strong tradition of spoofers that led Twitter to start verifying accounts. Unlike on Facebook and Google Plus, Twitter doesn’t require that you prove who you are. As long as it’s available, you can register any name and assume whatever identity you like, anonymity intact. Okay, I’ll admit from the outset: I’m writing this post as a form of therapy. So if you can’t stand whining and complaining, like I usually can’t, stop reading now. Last night I made myself a salad with President’s Choice Organics Field Greens Salad Mix, some cucumber, a few pieces of cheese, a whole lot of fresh garlic, and a bit of basmati rice. I sprinkled it all with some olive oil and balsamic vinegar. Salad. I love salad. I eat it every day. Sometimes it’s all I eat in a day. In other words, I buy a lot of salad. Sometimes I buy the President’s Choice Organic Spring Mix, sometimes it’s the Dole one. It all depends which is cheaper. The rest of the stuff (cucumbers, tomatoes, garlic, carrots, etc.) I hand-chop. But I go the easy route on the greens. They’re pre-washed, pre-cut, and ready to eat. Or so I thought until last night. As I chowed down on that above-described salad, my mouth happened on an unexpected crunchy bit. Well, more a mouthful than a bit. I figured it was maybe a large piece of radicchio or a part of the heart of a lettuce at first, but it was just so big. Just so freaking enormous in my mouth. Alarm bells went off. Something’s all of a sudden not right in my mouth. I decided to take that weird piece of crunchy greens out of my mouth. So I innocently reached in, grabbed the anomalous chunk of salad stuff and pulled it out. And I looked at it. That was my mistake. I looked at this big chunky crunchy thing as it came out of my mouth and found myself staring into the big, beady eyes of an insect. A big insect. A big, fat, juicy freaking grasshopper with its legs all splayed out weird from the biting motion of my teeth. Of course, I gagged. I admit I retched a bit too. There’s no shame in that, I figure. Fortunately (or unfortunately, I don’t know), I didn’t puke. But I sure felt like it. I got shaky, too, which was weird. I spit out the rest of what was in my mouth, washed my mouth out several times with water and gagged a few more times involuntarily. Then I just sort of paced around the house for a while, totally freaked out. I had a grasshopper in my mouth. In my mouth there had been a grasshopper. 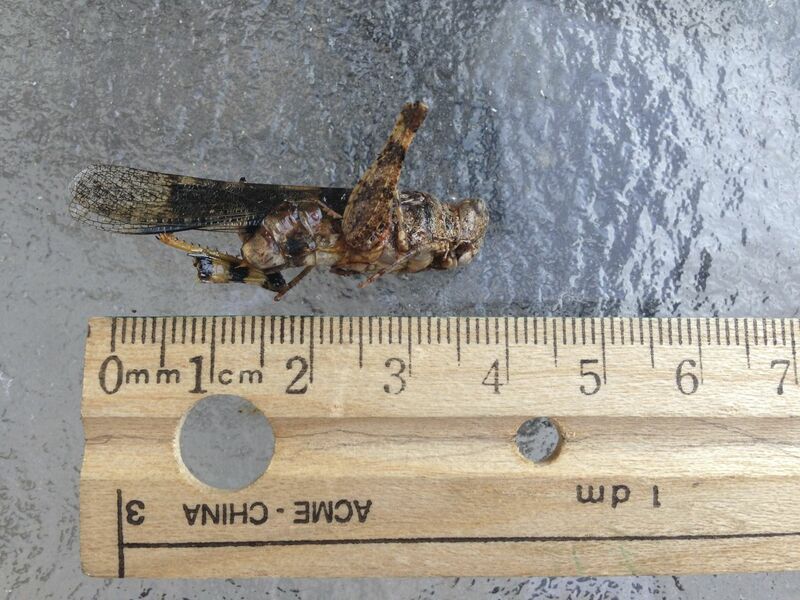 An enormous, crunchy, juicy, bug-eyed grasshopper. It had been in my mouth. In other words, something unexpected had been in my mouth. Something that I had never wanted in my mouth, ever, had been in my mouth. An unwanted, unexpected thing had been in my mouth. And it just so happened, to make things worse, it had been a great big crunchy juicy grasshopper. This is the part where I sound a tad manic, so please excuse this outburst if you feel it’s a bit over the top. I felt violated. I know that’s a big loaded word, fraught with all sorts of meaning. But this is more than 12 hours later here and I’m still freaked out. I won’t put anything else in my mouth. I won’t eat anything else. I just keep thinking of that big, crunchy, unwanted grasshopper crunching strangely between my teeth and against my tongue. I keep recalling that moment that I looked at it as it came out of my mouth. It’s still nauseating to think about. I’m no foodie lightweight. I’ve been to Asia several times and eaten all form of strange creature in a number of countries. But I am a control freak. I like to control what goes in my mouth. And some crunchy, juicy big grasshopper went in my mouth without my knowledge. So, as you might expect, I called the President’s Choice help line this morning. 1-888-495-5111. I spoke to a representative who collected information about the product and situation (oddly, she asked if I still had the grasshopper, which, oddly, I do in a ziplock bag in the fridge). She assures me that a thorough quality investigation will take place, thanks for calling in with this. Good bye. I say, “That’s it?” I’m thinking we need to sound the alarm here — what if other people have grasshoppers in their salad? We need to warn people! She lets me know I can take the package back to Superstore to exchange it for a new one. Seriously? WTF? Like I’m going to eat more President’s Choice Organics Field Greens Mix after I just found an enormous crunchy juicy grasshopper in the last pack I ate? Are you freaking nuts? A chink fell out of the President’s Choice brand for me today. Because I’m sure the President, whichever President we’re referring to, would not choose to find an enormous crunchy juicy grasshopper in his or her salad. But I did. And “The President,” doesn’t really seem to care. So there. Therapeutic blogging, like Dr. Watson in Sherlock. Session over. I do feel a bit better for having writ this. And maybe I’ve even provided a service. Maybe after reading this someone, somewhere, sometime will be a bit more cautious when preparing a salad using President’s Choice Organics Field Greens Mix, and find the giant crunchy juicy grasshopper before it ends up in somebody’s mouth. Because, believe you me, you do not want to find a giant crunchy juicy grasshopper in your mouth. Unless you mean for it to be there, of course. Which is cool, if that’s your thing. I won’t judge. But it shouldn’t end up there if you don’t want it to. The (I-wish-it-were-actually) hot days of summer are upon us and it’s time to look at some exciting technologies that suit both the season and our vacation-influenced shoestring budgets. One handy little doo-dad that can be had for hardly a chink out of that dwindling wad of dollars in your wallet is the hatchet. There are many uses for the hatchet, from felling saplings, to constructing a crude survival shelter in inclement weather, to awkwardly banging nails.